chances of rain tomorrow and possibly Saturday. Temperatures in the low 90s through the weekend. Next week looks like mid to upper 90s. Slight chances for rain Tuesday. Basically, no change in generation pattern. Off in the a.m. Two units on by 1:00 p.m. and all four by 2:00 p.m. for about seven hours. Stan out last Wednesday with Glenn and Mel from the St. Louis area. Good days for these guys on the P&P in the a.m. and then the crackleback when the water can on. who had thrown a rod before. Stan had Warren & Donna. I think it was Donna who brought in a 15″ rainbow. 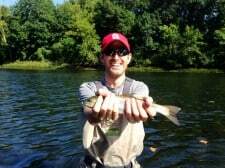 Jason and Heather were with Jim and they brought in a 17″ rainbow. Carolyn took Carol and Ed. 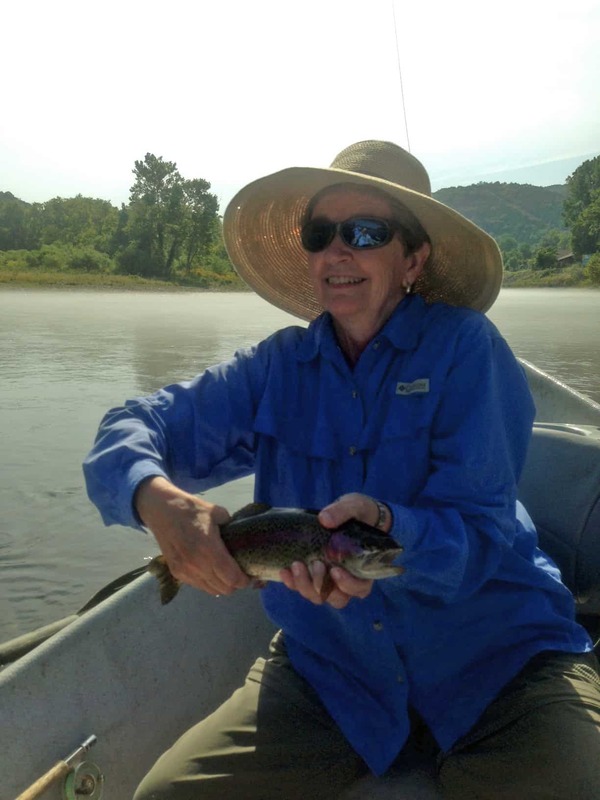 This was Carol’s first experience fly fishing and she brought in a 15-3/4″ rainbow. Darrell had John and Cliff, and Dana took Mike and Jack. Steve and Mark were wading with Gina. Of course, they had their contests going for the most fish, the biggest, etc. It was a win-win day for everyone as it turned out to be a nice day….not too hot yet. They were not in a meeting! 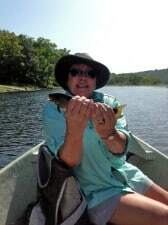 and most were have a new experience learning how to fly fish! Overall, the best patterns were the JQ streamer, P&P midge, black copperhead midge, b-bug and a root beer midge. Tuesday, Jim, Gina and Carolyn had the opportunity to take a group of veterans with Project Healing Waters out for the day. Jim and Darrell also had them out again on Wednesday. We thank each of you for what you have done or are still doing. We hope you had as much fun as we did!! This entry was posted on Thursday, August 28th, 2014 at 8:57 am	and is filed under Fishing Reports. You can follow any responses to this entry through the RSS 2.0 feed. You can leave a response, or trackback from your own site.